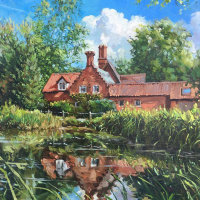 Acrylic is the perfect medium for capturing the flickering light effects of dappled sunlight and sparkling reflections. When done successfully these painting always draw our eye, with a sense of admiration and perhaps a little envy. Discover the tricks and methods used to achieve the balance and harmony of tone and colour to make your work successful.